Games Design and Informatics students at London South Bank University (LSBU) came together to take part in a two day inter-disciplinary Games Jam, where teams of students competed to design, create and develop digital games. The event took part during Global Entrepreneurship Week in November 2015. The Games Jam gave students insights into the games industry and professional experience of coming up with ways to solve real world challenges. “A Games Jam typically is a space where people who make games get together and they make a game in a very short amount of time. This is a really unique Games Jam because it incorporates accessibility and usability, IP, and games developers and informatics students all in one place,” said Siobhan Thomas, Game Design and Development Course Director at LSBU. 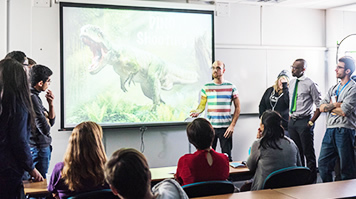 The event formed part of LSBU’s Ignite programme, which helps students and academics across all subjects understand and utilise Intellectual Property (IP) through curricular and extracurricular workshops, lectures and challenges. Students showcased their work to a small panel of academic judges. Criteria included demonstrating key skills such as communication and team work, in addition to game development. The winning teams were ‘Dino Shooting’ and ‘Eyes Wide Open’. “I learnt how to collaborate with others that were not from my course necessarily. I just learnt how to give criticism but at the same time keeping a professional manner,” said Anab Hussen, final year BSc (Hons) Business Information Technology student. Games Design students were the clients of the Informatics Students, who applied their knowledge of IP into the practical experience. They consulted on the IP implications of their work from copyright to legal rights, teaching the importance of IP in employability and enterprise. The Ignite project won funding in the Government’s Intellectual Property Office (IPO) at the StudentshIP Enterprise Awards in March 2015. “Having an early working knowledge of intellectual property is crucial and we must foster the entrepreneurial capability of the next generation, to secure the UK’s continued global competitiveness,” said Baroness Neville-Rolfe, Minister for Intellectual Property, at the awards. Find out more about the LSBU’s other IP activities on our Ignite blogsite.